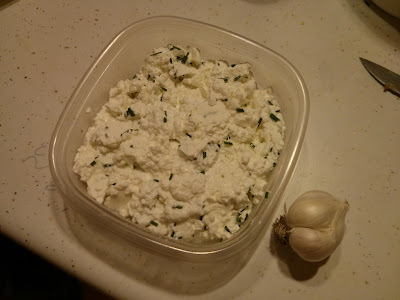 Today was a playing with the girls, making cheese, gardening, cooking for 8 people (including leftovers) kind of a day. Pretty sure I'm going to sleep great tonight! The portion of the garden that was prepped for the corn didn't end up deep enough so too many sprouts of weeds and grass poked through to be manageable. Tonight I fixed that. 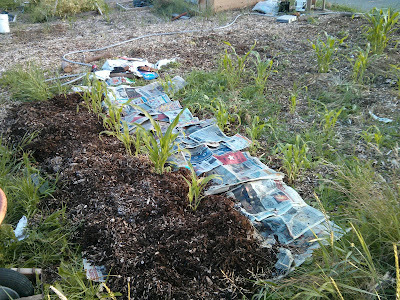 Last week I weeded well around the corn itself to make a bit of buffer and tonight was chop down the problem areas, lay newspaper, wet newspaper, spread wood chips 8 inches deep. 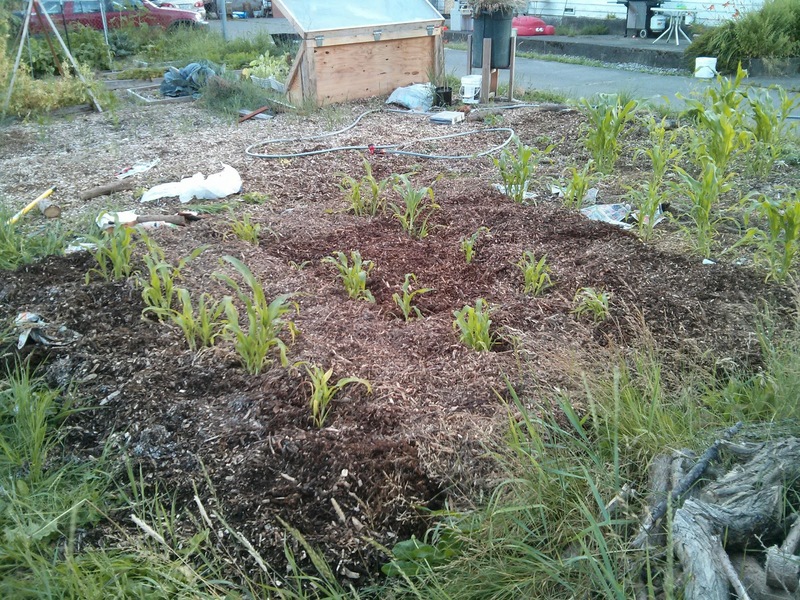 It is important to not bury your young plants with the wood chips. They don't like that. Picture #1: In progress. L to R: final stage, paper stage, chopped greens stage. Picture #2: Beautiful! And so easy to manage as the rest of the garden can testify. Picture #3: The cheese I made today was actually commissioned by one of Tim's coworkers who is now a repeat customer. One batch makes approximately two pounds. Does anyone want to claim the one pound of garlic chive soft cheese left? It's delicious!